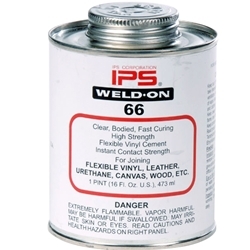 WELD-ON 66 is formulated for bonding flexible or rigid vinyl (PVC) to itself or to urethane, leather, canvas, ABS, foamed PVC, butyrate and wood. WELD-ON 66 is recommended for fabricating or repairing flexible vinyl in numerous applications: pond liners, shower pans, pool liners, moisture barriers, waterbeds, upholstery and wearing apparel. WELD-On 66 also bonds urethane, leather and canvas to themselves and to wood, cardboard, Kydex, butyrate and ABS.